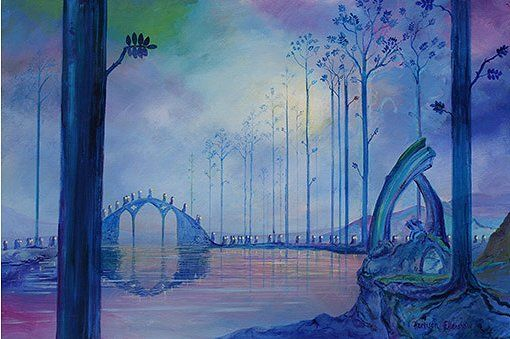 Harrison Ellenshaw Hand-Signed and Numbered Limited Edition Giclée Canvas: "Ave Maria -Fantasia"
The final sequence of the classic film Fantasia is a dramatic visual artistic realization of the stirring, 'Ave Maria' by Franz Schubert. For the most recent BluRay release of the film, Harrison was commissioned to provide the sidebars (a virtual proscenium) for the 'Disney View' 16 x 9 version. Here Harrison has painted new interpretive artwork of the procession of robed figures moving across a Gothic bridge and through majestic trees and ruins.